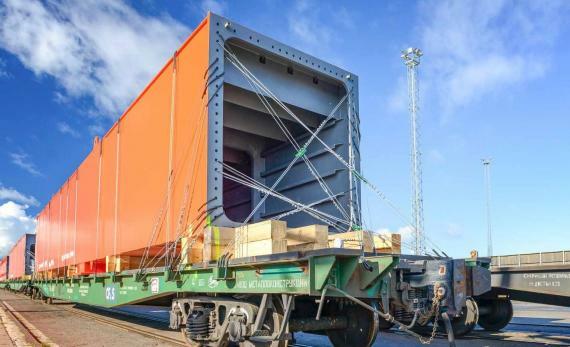 Members in Estonia, Latvia and Lithuania, CF&S are an expert international transport and logistics group established in 1997 specialising in transporting exceptional cargo by sea, road and rail. Their years of experience working on large-scale projects enable them to provide complete logistics solutions and to bring a range of different projects to successful completion. Sales Director at CF&S Estonia, Daimar Truija would like to draw attention to the below PDF presentations on their rolling stock department detailing their specialised rail platforms and boxcars and some of their recent high and heavy transport work showing their chartering, trucking, port handling and railway transport services including the 6 crane parts photographed right (each at 48tns / 20.5 x 3.2 x 3.2m) shipped on CF&S railway platforms from Paldiski in Estonia to Archangelsk, Russia. Daimar concludes; "Please feel free to contact us for inquiries of transport via Baltics to CIS countries and vice versa. Our primary email to be used for projects is project@cfs.net."